Its really easy to see how the drought has been exponentially sped up across NSW and parts of Victoria over the course of 2018. The majority of both States is sitting not just below average, but phenomenally below average and its been the epitome of a failed storm season and horrific Winter. Initially when you look at the map, the East Coast of NSW and Eastern parts of VIC stand out. The rainfall deficiency is horrific. 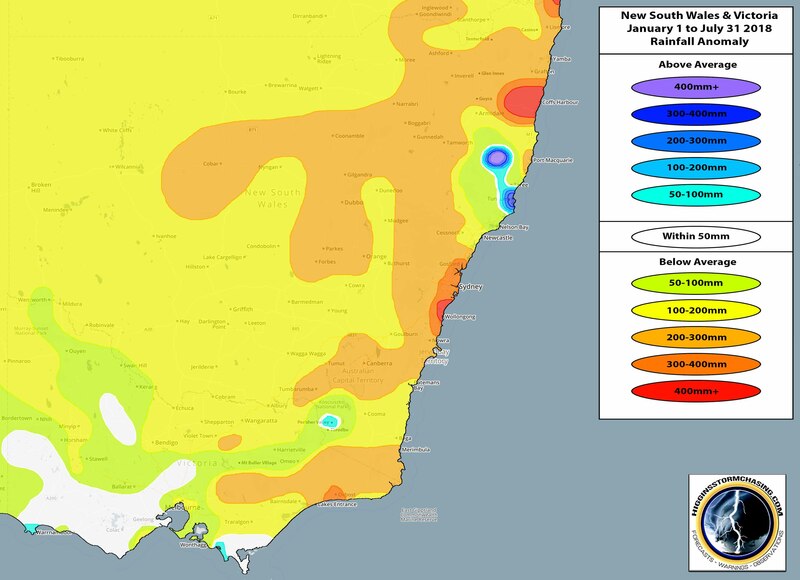 The Tweed and Wollongong are down around 400-500mm on average. A normal year, a healthy year would give Bellambi Point near Wollongong a respectable 771mm across the first half of the year, in 2018 that number is a mere 328mm. Its the Coffs Harbour / Dorrigo region that has the greatest deficiency with some areas being more than 500mm below average and localised spots no doubt even greater than that. Greater Sydney for the most part is around 250-350mm below average… a normal year would yield 830mm roughly, 2018 has produced just 503mm in Sydney City. These rainfall deficiencies seem massive, and they are, but these locations all have 1 thing that Inland NSW doesn’t have, and thats rainfall. Most places along the East Coast of NSW have seen 200-400mm, some higher. That at least fills tanks and keeps the ecosystem running. Yes it will look dry, but there is still water coming out of the tap and dams are at least at a reasonable level (not great, but reasonable). Try Inland NSW… this is clearly the combination of not only a failed and abysmal storm season turning into an endless heatwave as well as a normally consistent rainfall pattern during Winter going completely missing as the fronts move across produce zip. While the maps show a lower deficiency, thats merely due to the averages being far lower. Thats when you need to look at the actual totals. • Fowlers Gap – Average of 167mm, grand total of a mere 7.0mm. There hasn’t been more than 5mm on any given day since July 31st 2017, more than 1 year ago now. The 7mm has come out of 11 days of rain… that doesn’t even darken the dust, let alone settle it. • Broken Hill – Average of 149.6mm, grand total of just 18.4mm. • Menindee – Average of 134.2mm, grand total of 19.3mm across 13 rain days. • Cobar – Average of 219.4mm, total of just 26.6mm. • Smithville on the NSW / SA border – No average, but only 30mm for 2018. What about Northern and Central Inland NSW, these areas have arguably suffered the most and thats where so many requests are coming out for immediate help. Dubbo, Parkes, Nyngan, Coonamble, Gunnedah, Tamworth all average over 300mm in a normal year, yet are suffering through a horrific total of 75-125mm for 2018. Places like Coonabarabran and Woolbrook average over 400mm with less than 150mm recorded. You can say the drought has been around, you can say these Inland places are normally dry… but how does a farmer, a property owner, someone who runs feed lots and is a part of the farming life, how does someone like that see a long range forecast for near normal rainfall – i.e. the rainfall averages listed above, and then need to scramble because less than 30% of that normality has been delivered across 6 months! Nobody can prepare for normal and survive that kind of reality. Nowhere that averages nearly 400mm in half a year, should expect less than 100mm in the same time frame. Its a perfect illustration of how a bad problem was made catastrophic before our very eyes!